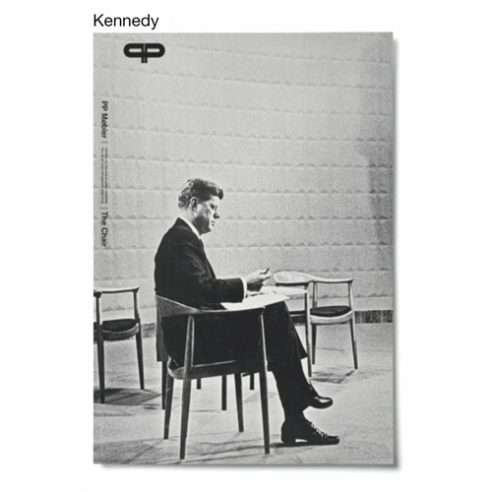 Printed in black and white on art paper this poster is of the iconic image of Kennedy sitting in The Chair during the first US Presidential debate in 1960. The image marks the event considered one of the great moments in American Political history. Nixon in the first presidential election debate to be televised on NBC. They sat in “The Chair”. The historic debate proved favourable to Kennedy amongst television viewers and pivotal in the forthcoming election. The Round Chair became one of the most sought after designs on the American market. It became known simply as “The Chair” somewhat to the embarrassment of its designer Hans J. Wegner who always referred to it as “The Round One”..